Dreaming of a summer garden? Savoring delcious meals with fresh from the garden ingredients? Choose Your Pots – As long as they have drain holes, anything goes! Be creative and think beyond the basic terra cotta pot…wagons, buckets and even old toilets work well. Find the Sun – Look for an area on your deck or patio that gets at least 6 hours of sun. Add the Soil – Try Nature’s Care Organic Potting Soil with Water Conserve because it prevents you from underwatering or overwatering which is really important in a container garden. Feed Your Plants – Nature’s Care Organic and Natural Vegetable, Fruit and Flower Food is like an all-you-can eat buffet for your plants because it feeds for up to 2 months! I’m feeling like quite the accomplished gardener thank’s to a little help from Nature’s Care. 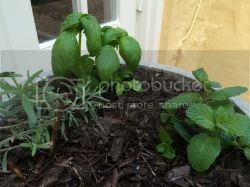 Take a look at my herb container garden…I wish you could smell the rosemary, basil and mint. I’m looking forward to a tall glass of iced tea with a sprig of fresh mint to go along with my Simple Summer Pasta that’s bursting with fresh basil and tomatoes. Who knows, maybe I’ll try planting tomatoes too! In a medium bowl, combine basil, tomatoes, garlic and olive oil. Let sit at room temperature for 3 – 8 hours. With the heat on low, stir in cream cheese until combined. Stir in the basil mixture and serve. What will you make with your freshly grown herbs and vegetables?